NOTE: Please, be kind, and don’t submit any payloads to ANY online virus scanner! Please be sure to check out https://www.veil-framework.com, Veil’s website for the latest tutorials, updates, and repo location. Any questions on using Veil? Join us in #veil on Freenode! With these goals in mind, I continued researching methods of bypassing AV. Since I wanted to maintain metasploit compatibility, I chose to use shellcode generated by the metasploit framework, specifically msfvenom. To accomplish this, I began looking into other available research, which is where I discovered a number of interesting techniques that a variety of people, such as Dave Kennedy and Debasish Mandal, already began to develop. From their research, I learned about really interesting ways to inject shellcode into memory through python. These methods were the foundation of the rest of my research. Since the majority of our assessment are against predominantly Windows environments, it was important that the tool worked reliably against these systems. Since I chose to write the tool in Python, I had to figure out how to package the Python output files containing the obfuscated shellcode to execute on Windows without requiring Python to be installed on the target machine. One of the solutions I looked into was using Py2Exe. I knew other software used this method to convert their Python-based scripts or tools into an executable that could run on Windows and figured I could do the same. I began testing Py2Exe with the payload files I developed and was successful running the executables on various versions of Windows, so I stuck with that solution. The final part was for me to develop a tool that automated the payload generation process, and I’m happy to release Veil. Veil is currently capable of using 7 different methods to make 21 different payloads, all of which result in meterpreter connections. Veil provides the user with the option of using either Pyinstaller or Py2Exe to convert their python payload into an executable. With Pyinstaller, Veil users and have their file converted into an executable all within Kali and does not require the use of a second VM/Machine. When using Py2Exe,Veil will generate three files to which are required to create the final executable; a payload file (in Python), a file with runtime instructions for Py2Exe, and a batch script which handles converting the payload file into an executable. To generate the final payload, copy the three output files to a Windows host with Python, Py2Exe, and PyCrypto installed and execute the batch script. This will build the final executable that is uploaded to the target. The executable file can be dropped anywhere, on any Windows system, as all required libraries are stored within the exe file. Once dropped on a system and executed, the payload will result in a meterpeter callback that is undetected by AV. I’ve tested the packaged executable against multiple AV solutions (MSE, Kaspersky, AVG, Symantec, and McAfee), on both test systems and “in the wild,” and have a very high success rate, bypassing detection in almost every circumstance. I hope that, by releasing this tool, I can enable others in the community to provide more effective assessments by allowing them to focus their efforts on security risks and spend less time bypassing ineffective security measures that wouldn’t deter an actual adversary. Run the setup script (setup.sh) and follow the installation process. Once the setup script has completed, delete the setup script. Run Veil from Kali and generate your payload. If using Pyinstaller, your payload will be converted into an executable and is available for immediate use. Move the payload.py along with its two accompanying files onto your Windows machine (that already has python and the other dependencies from above installed). All three files should be placed in the root of the directory Python was installed to (likely C:\Python27). Run the batch script to convert the Python payload into an executable format. Place the payload file on your target machine through any means necessary! Research new methods of encrypting or obfuscating the payload. Research other languages with direct access to the Windows API for delivering the payload. Want to play with Veil? Feel free to do so. Download, clone, do anything you’d like with it. You can download Veil here – https://github.com/Veil-Framework/Veil-Evasion. I hope that it can help others on their tests just as it has helped me. Please, if anyone has additional functionality they would like to add, I’d love to have input from the community! I’ve been using this technique in my custom code for quite sometime. One recommendation — create template files, rather than creating it with all the Payloadfile.write(). Thanks, appreciate the recommendations. We’re definitely looking to do both suggestions shortly, after a lot of testing, we were happy where we are at for an initial release, but do plan on trying to turn this into a usable framework to allow contribution from the community. I think you spelled your name wrong in the “by”, looks like you may have just dropped an r. Excited to give this a shot and dig your use of the Polished theme! haha, good catch. That was a fail. Just updated. Thanks for letting me know! One question. When I choose Pyinstaller where the payload have saved? Like @selsroger mentioned below, the payload.exe file will be in the same directory that you launched Veil from. Could you let me know exactly what you installed for py2exe? We’ve done extensive testing and haven’t encountered any issues yet, but if you could let us know exactly what you installed, we could try to re-create the issue and then determine how to fix it. @Alexandros Iliopoulos: in the directory from which you have launched veil. You can see this easily. Launch veil but don’t chose between 1 & 2, pyInstaller or py2Exe so it just sits there waiting for input. Payload.py will have been built and be sitting in the cwd (just ls). Actually Chris, on 64-bit kali, wine isn’t installed. Launching the setup script will get a helper wine64 package ask to setup multiarchs and install the 32-bit wine. After doing this, on my system, Python wasn’t installed under wine. So when using Veil, obviously pyInstaller does not succeed in creating the payload. and later the temp payload.py is cleaned up. Yeah, you’re absolutely right. We initially tested on and developed for x86 Kali, but supporting x64 Kali is important to us as well. Looks like you helped to save us some time in supporting this, so thanks! We’ll be adding this capability to the tool shortly. Thanks for the great tool in advance. But the solution above doesn’t work for me as well. No payload is generated using pyinstaller.py. The payload.py file gets created under the source directory. Don’t know what i am doing wrong. We don’t recommend making that change which is in the article as it can break Veil. You need to give us a little more info to help. What version of Kali are you using? Did you run the setup script? Please reach out to us on twitter and/or Freenode irc channel #veil and we can give live support. Kali did run and had no errors with that at all, except no .exe file was being gerated. Then i downloaded the files from git and ran the setup.sh file. Same results – no .exe file. We posted that there currently an issue with installing Veil via apt. The offsec guys (they’re an awesome team) are currently looking into fixing the veil package, unfortunately it happens considering Veil requires a wide variety of dependencies for the payloads that it generates. And unfortunately, if you try installing via apt, it causes issues when installing via git too. Easiest way would be to go back to a snapshot before you installed veil via apt, and instead install it via git. It’ll work for you then. Is there a tutorial somewhere where i can follow it and you mentioned snapshot in Kali, how do i go about doing that? But the link will be great. You would have needed to have taken a snapshot with VMware (or your virtualization software of choice). There isn’t a tutorial for installing Veil because all you need to do is run the setup script and it handles everything. If you’re having issues, Honestly the best bet is to try with a clean system. You are potentially going to have issues when trying to install from git after a failed apt install. Yeah, sorry might not have been what you were looking for, but git, as of right now, is the way to install due to a bug in the veil package. I’m 100% certain if you have a clean Kali and install/setup veil from git, it will work for you. are what should be executed on kali 64bit before launching the setup.sh script. This is absolutely amazing !!!! man,this i an awesome work! What sort of machine are you running it on? I have tried from a windows 7 machine and kali (both with no firewall). The victim machine is a windows 2003 sp2. Which wrapper are you using? py2exe or pyinstaller? Can you try both? Just tried it with pyinstaller and getting the same results. Getting the meterpreter prompt, but nothing is loaded. What’s your environment that you are using it in? Also, might be easier to hit myself (@ChrisTruncer), @themightyshiv, or @the_grayhound up on twitter, and provide us a pastebin of everything you’ve been doing. Just tried this on a winxp machine and everything worked great. Wonder why the win2003 machine is giving me problems. Going to try and get more info about the system. Failed to load extension: No response was received to the core_loadlib request. Can you check, are you using the latest version of Veil? I am running the latest version. You should hit all three of us up on twitter. Give us all the tech specs of what you are running on your systems, and pastebin the entire thing so we can see what you’re doing. I haven’t tried the tool yet, but just out of curiosity, I would like to ask something. When someone generates a meterpreter based payload with metasploit into an exe template, then metasploit will put there the 1st stage which will then get the rest of the necessary modules upon connection with the evil machine. So, does that tool basically try to hide that 1st stage? Pretty much. This is kind of a wrapper for meterpreter’s stage 1.
well done, it’s working great so far. any plans to offer x64 msf payloads eventually? also, you mention it works on “almost” all AV products – can you disclose which ones caught it? Ugh. Best not to upload stuff like this to VT as AV vendors have been known to use VT’s signatures thus making things easier to detect. Yea… the longer this stays out of VT, longer it’s likely to stay undetected and remain useful. We can definitely look into adding x64 meterpreter, that wouldn’t be hard to do. We just wanted to start with the x32 bit versions first. We mentioned “almost” all AV products because we just simply haven’t tested EVERY single AV solution out there. Of the ones we’ve tested, it’s bypassed everyone of them. However, just due to not having tested all solutions, we just didn’t think it was fair to say we bypass them all. Well done alex !! IOMG,it is a common rule and everybody knows NOT to upload samples to VT for checking since there’ll be signatures soon in the AV products for your sample ! Chris, firstly congrats, brilliant tool. Could I suggest that perhaps you put an explanation at the top by your comment about not uploading to VT? I think Hugo Sanchez said it quite well so words to that effect. Well isn’t it counter productive not to? I mean are these methods developed for the good or bad? No, we don’t want to submit them because we would like the payloads to avoid AV. Ah ok. I thought the idea was to have the Av protect from people using this method to do evil. There’s a lot of legitimate reasons to release a tool like this. While that is one, it isn’t our goal. Primarily we released this to help pen testers and red teamers during their assessments. Ok. Well I just think I have a hard time seeing how this industry works. What exactly? We already know that malicious actors can perform the same task quite easily. Shouldn’t we allow the white hat’s to perform the same capability? Sorry, but i can not to download setup/requiredfiles.zip because this file is big! ( Can you halp my??? Those are all the files required for setup, so it might be useful to have. Dear, Chrys! Can you create tutorial video, where you showed how install and exploit Vail! Please! can you port Veil to mac (no wine)? We do have a goal to make Veil not rely on any underlying OS, but purely on Python, but as of now it is reliant on Linux. It does work best on Kali, and as of now we recommend using it on Kali. How can i use Veil to create a payload On external IP ??? When i try to Create a payload thrs no option to create payload for External IP..
May b thrs another method i dnt knw..
Could you elaborate on that? You provide the IP address that the callback goes to, so it can be for any IP. as u said anyIp .. can we put our Public IP when it says Enter ur local IP ?? Not on my same Network On Internet i mean ?? Yes, you can use your external IP address, or any IP address. Sir 1 major prob plz help me ..
[Error]: Can’t find python.exe in /root/.wine/drive_c/Python27/. Make sure the python.exe binary exists before using PyInstaller. Just dropping by to say thank you and that you did a brilliant job. I appreciate the effort. Thanks for both accounts, we all appreciate it. maybe a little stupid question? but there are too many files on your github link? how do i get all modules etc ? cause it will take me ages to download all files?. Thanks and sorry for a noob question. By the seem nice. all the best for upcoming updates. No, there aren’t too many. The reason it is semi-large is because we have all the required setup files included within the git repo. We included them because we’ve tested with those specifically and they are known to be working. Hello Chris sorry for the bad english!! The Payload crash when i try to run it, the machines are windows xp (italian) x86. i’ve installed the requirement that you have indicated. Hi there, we need a bit more information. Are you running the latest version of Veil on Kali? Have you updated it? How are you generating your payload files? i’ ve downloaded veil yestarday from github,so i think to have the latest version. i’ll create a twitter account soon. The readme and this blog post says to run Veil on Kali. You might need to check into your port forwarding. Would be great if you could specify hostname for reverse_https instead of just IP address. Other than that, great job! Did you run the setup script? Are you using Kali x86? Do you have python installed within wine? Thanks a lot for this tool. It works perfectly. Just a little question, somebody tried to convert the payload.exe, obtained with veil, with exe2vba of metasploit for obtained a macro for MSOffice? I’m tried but sometimes work and sometimes receive an error when open word . Somebody can help me? Thanks in advanced? We haven’t tested the capability of that. So as of right now, we’d have no idea if that worked or not. Hi. Just picked up Veil today and been playing with it this afternoon. Excellent job. I’ve been having a bit of bad luck with some of the resulting *.EXEs — 3 of them got picked up by Norton (Argh!). However, all of the powershell payloads I created, work like a charm!!! Great job, Christopher. Keep up the good work! What version of Norton were you going against? What payloads did you use? What was the message that Norton had detected the exes with? 1. I used 3 PCs, all of them brand new. 2. They all had a version of “Norton Internet Security” pre-installed. 3. The attacking machine, was a remote VM. 4. The payload was created using “python/DESVirtualAlloc” and compiles with pyinstaller. 5. No additional ‘msfvenom’ parameters were used. Norton identified the file, as “Metasploit”, correctly identified the destination and port. It was just a test — I didn’t bother to encode the payload. Dear, Chris! When i use Py2Exe, Veil no creat file in output/compiled/ ! Can you help me, please! Py2Exe requires python and other dependencies installed on windows. Review the Veil readme file, it details exactly what you need. When using py2exe, you move the files from the source folder into your windows machine and convert into an executable there. I was mistaken! When i use Pyinstaller!! If you need support, which it sounds like you might need help. The best place is to talk the three of us developers on twitter, or in #veil on freenode. When i use Pyinstaller!! Veil no creat file in output/compiled/ ! Please contact us on Twitter, or even better, within #veil on freenode. We can help you there. Is this a bug, or my shellcode is too big? Are you using the latest version from github? Thakyou Christopher.. I got it. Hello and thank you for the tool. I have tried it few times, looks great. I really hope you will continue developing it. I am new to Kali and security in general. Is there an option in Veil to merge the payload.exe generated with another custom executable, lets say an http://ftp.exe? If not do you know of any tool in kali which will give me the option to do so? Thank you. Fixed myself- Working great! <3 Thank you so much for posting this. What was the issue? It need a patch? Is it possible to add msfvenom options such as -x for template name? At one point it says: Enter extra msfvenom options in OPTION=value syntax,. If I want to add a custom template how do I go with this one? Tried few methods but no luck. I think this one was asked in one of the above posts too. Yeah, you can add extra options exactly in that OPTION=value section of veil, but the only one that won’t work is the -x. That’s because you’re not cloning an existing template when using Veil, it’s making its own template. Do you consider this as a future additional to Veil? It will be great if we had the option to inject the new Veil exe into let’s say putty so it runs when you open putty. [ERROR]: Either run this setup script as root or install sudo. Is there anything wrong i am doing? Went through the python setup and voila…works like a charm. I created a python style payload (with pyinstaller) but when I run this payload on my machine the program is quit after some seconds…. How can I debug what is the problem? 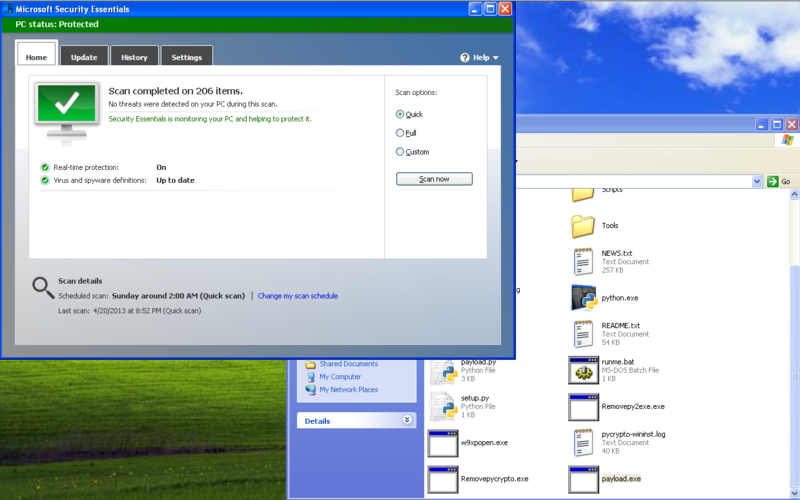 My environment win7 x64 + SCEP 2012. the AV didn’t alert me…. Can you send us a message on twitter, and give us a pastebin of everything you’ve run? I restarted the handler and the payload works nice now. I have 2 machine. One laptop is at home & another desktop is in my office. In my office everything works fine. (python install in wine, etc. Everything is very nice. what I should to do ? please help me. ps: The Veil is Excellent. Great work man! For the one with issues, how did you install wine? Did you do it from apt or from cloning the git repo? I just need a little bit more info to be able to help you troubleshoot this? I installed wine with apt-get install. Awesome, thanks for posting a suction in case anyone else has that same problem! I believe Kaspersky may be catching it sometimes based off of heuristics. Currently, Veil-Evasion is designed to evade disk based detection. One thing you could try is a powershell based payload, or signing the payload. Also, you could try to modify the source code, and re-wrap it into an executable and try to evade it. If you create something that does it, you should certainly let us know or submit a pull request for a new payload, we’d love to see it. hi ! I have Created a Payload by Veil, it really gr8, just have 1 problem that i am not much happy with its file size, its about 3MB 0r 3.1 MB. is there any solution to reduce the file size of payload ?? I will be very gr8full to you. Just use a different payload. if anything you suggest ? [*] Your payload files have been generated, don’t get caught! That’s normal output. Go to veil’s website (https://www.veil-evasion.com) and there’s a guides/videos section. It shows what generating a payload should look like. Well, ok, I remember, during the setup, I had this kind of “errors” is that the normal output too ? I can’t speak with 100% certainty due to having only tested on an english system, but it does also look like the same output when installing on an English system. So I believe it is normal. If you are running into issues, it might be easiest to hop into #veil on Freenode where someone can help pretty quickly. Do you have a link for Freenode ? And last question, the question is about LHOST, we have to write the internal or external IP, I do believe it’s internal IP, isn’t it ? Google how to connect to IRC freenode, then join our room. LHOST can be either, it depends on your environment, so you will have to figure that out. Hello ! I want ask about veil 2.0.5 … how to setup the-backdoor-factory-master?? It hasn’t been updated in Kali yet, we have an open ticket for it to be updated. In the meantime, you can clone our github repo to get it. Do I really need an 86 to get your system running? Thanks for the kind words. That’s a really good question, as of now we don’t have a way to do that, but that’s a really good idea. Worth looking into. Does each payload come out different meaning if I or someone did upload to virus total and discovers trojan does that make that single executable tainted or does it ruin future generated payloads? [!] ERROR: Can’t find python.exe in /root/.wine/drive_c/Python27/ [!] ERROR: Make sure the python.exe binary exists before using PyInstaller.